He followed me home. Can we keep him? Unfortunately, loose dogs and cats are all too common in Dallas. Thirteen-hundred sixty-one dogs and 88 cats were impounded from the field by Dallas Animal Services (DAS) in November 2018. On December 26, a big, long-haired dog followed me and my foster dogs to my front door as we returned from our morning walk. Fortunately he walked right up to me and allowed me to put a slip leash on him (he wasn’t wearing a collar). I deposited him in my backyard and immediately launched into problem-solving mode. Because I needed to drop off a foster dog at a Grapevine vet before starting work back in Dallas at 9 a.m., I didn’t have much time to sort out an extra dog. The Dallas shelter doesn’t open until 11 a.m., so dropping him off that morning wasn’t an option. I didn’t want to leave the visitor in my yard all day unattended, especially since my dogs were barking incessantly at the intruder. After posting his picture on NextDoor, I left the friendly pup with a neighbor who was home to keep an eye on him. After work, in the pouring rain, I drove our guest to DAS before returning to the Grapevine vet to pick up Lucy. Fortunately, Buddy (as his name turned out to be) was microchipped, and his family picked him up at the shelter the next day. What steps should you follow if you find a loose dog or cat? 1. If possible, capture and contain the animal carefully. Approach an unknown animal slowly and cautiously while speaking calmly and gently. Food is a good way to entice a reluctant animal to approach you. Dogs should be secured using a leash or kept in a fenced yard. Cats can be put in a carrier or secure box (with air holes), your garage (weather permitting) or a small room in your house. Even if the dog or cat seems friendly, keep him separate from your pets. An unvaccinated or sick animal can jeopardize your pets’ health. If the dog acts aggressively, call animal control immediately. 2. Check for an ID tag. If you’re lucky, you’ll be able to call the owner right away. 3. Check for a microchip. All dogs and cats in Dallas are required to be microchipped. Vet clinics and animal shelters have microchip scanners. If you aren’t able to keep the microchipped pet until she’s reunited with her family, take her to the shelter. 4. File a Found Report with Dallas Animal Services (dallasanimalservices.org). 5. Take pets with no ID or microchip to the shelter. People are most likely to look for their missing pet at the shelter. Even if you filed a found report with the shelter, the information you provided may not match what the owner is looking for. 6. Post flyers and check lost and found sites. Even if you take the animal to the shelter, you can help his family find him by posting flyers in your neighborhood. Be sure to include a decent photo that shows the animal’s face and any distinctive markings. Post the animal in the Lost & Found section of your neighborhood’s NextDoor (social media for neighborhoods; nextdoor.com). You may also want to post the animal on missing pet sites such as Pawboost.com. Check for lost pets on websites such as craigslist.org or homeagain.com (sign up for Lost Pet Alert emails). With cats, it may be hard to tell whether a loose cat is feral or a stray (missing owned cat). Feral cats that have been Trapped/Neutered/Returned (TNR’d) may have the tip of their left ear snipped to indicate they’ve been spayed/neutered. In general, stray cats are more likely than feral cats to approach people, look at you and make eye contact and vocalize. Strays, who tend to avoid other cats, may look dirty and disheveled and are usually more active during the day. Feral cats are more active at night and, because they’re used to taking care of themselves, often appear healthy and clean. If you see newborn kittens without their mother, wait and watch to see if the kittens are truly orphaned. The mother may be off hunting for food or in the process of moving them. If possible, watch the kittens (from a distance of at least 35 feet) to see if the mama cat returns. The mother cat may be gone for several hours. 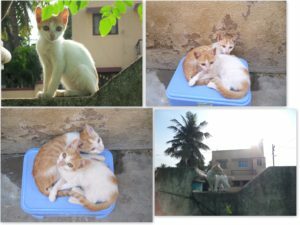 Remove the kittens from the area only if they are in immediate danger (e.g., heavy foot or car traffic, loose dogs or wild animals that may harm the kittens, extremely cold weather) or if you discover that the mother cat isn’t returning (e.g., she’s been hit by a car). What if no one claims the missing dog or cat, and you can’t keep him? Now what? Try contacting no-kill shelters like the SPCA (spca.org) or Operation Kindness (operationkindness.org)] to see if they will take the animal. At the SPCA, you need to make an appointment for an evaluation; you can’t just drop off the dog. These organizations will NOT take stray animals because they’re not set up to reunite pets with their families. If you’re able to foster the animal until she’s adopted, several Dallas-area rescue groups have guest dog (or cat) programs. The rescue group usually won’t pay for any vet bills (although they may allow you to use their rescue discount at vet clinics), but they will post the animal on their website and social media and invite you to attend their adoption events. Visit petfinder.com for a list of local rescue groups. Legacy Humane Society has an owner surrender program to keep dogs out of shelters. The rescue group must have an available foster home to accept the animal into their program. Thank you for making an effort to help loose cats and dogs in your community. They’re counting on kind-hearted people to keep them safe.